Spellirium’s Neighbouring Letters Rule | Untold Entertainment Inc.
We were very fortunate to have, as one of our early Spellirium testers, a fellow named Shan. Shan is a word wizard who is a member of – or in some cases the founder of – a number of Scrabble® clubs around the Greater Toronto Area. Shan made a really interesting suggestion to help us solve a problem in the game. You can just keep building words so that new tiles cascade into the grid, and hopefully that “L” will make an appearance eventually. You can craft a powerup that lets you “inject” a letter of your choice into the grid. So far, our testers haven’t found either of these solutions satisfactory. Continually rolling the dice in the hopes that your letter will show up is no fun. And the road to crafting a powerup is a long one: first, you have to complete an achievement to earn a spell. Then you have to collect the spell’s ingredients. Then you have to craft the powerup. Then you have to fill out a foolscap form in triplicate and mail it to your regional government. Can i have my “L” now please? Here’s what Shan suggested: let the player sort of control the letters that cascade into the grid. How? When you build a word and those tiles are removed, the replacement tiles are alphabetically adjacent. So if you need an “L”, spell a word with a “K” or an “M” in it. After removing a “K”, Spellirium will send one of its neighbours – either a “J” or an “L” – into the grid. This rule applies only to consonants; it skips over vowels. That’s because vowels are outnumbered 21:5, and we don’t want players to end up with grid full of consonants! For every vowel you remove, the grid gives you another random vowel. Vowel distribution is stacked in favour of A’s and E’s. The alphabet wraps. So if you spell a word with a “Z”, you’ll get either a “Y” or a “B” next (we skip “A” because it’s a vowel). It’s a neat solution, and while it could solve our problem, it creates another one: the rule is simple in practice, but a smidge complicated in theory. It’s not easy to explain eloquently. But did i explain it well in this post? Does this game rule make sense? Is it simple enough? Is there something even better that we could try instead? Let me know in the comments section! This entry was posted in Blog and tagged Spellirium on February 23, 2013 by Ryan Henson Creighton. Your written explanation was clear to me, but your illustration just confused me. ;) I’d say I understood it despite the visual. Drat! How would you doodle it? A. Find words in a grid. B. Plan ahead for new words you can’t quite make yet. C. Find smaller words that won’t steal letters from your big words. D. Combine what you know about A, B, and C to determine what letters you need, what letters are near the letters you need, and what words you can make that contain letters that are near the letters you need. Then hope that the odds of getting that letter you wanted go your way, which they won’t do 50% of the time, per letter, which may be even more frustrating after you get your seventh K in a row when all you wanted was an M, and I could understand if I only had a 1/26 chance of getting an M, but, come on, I have some control here; if my chances of getting an M are 50/50 after I clear an L, then why, why, why do I keep getting all these Ks!? But, of course, I’m just talking theory. Have you actually implemented this? Do you like it? You’ve probably explained the basics of Spelliriums mechanics before, but if you have, I’ve forgotten. Are you simply making words from a pool of letters, or do you have to connect the letters, Boggle-style? This game is kind of a Bookworm Adventures thing, only good, right? At any rate, it’s my understanding that your goal is to spell words that are worth a lot of points as quickly as you can. I almost think, though, that if you implement this rule, you’re setting yourself up to make something very different. It sounds like you’re using this rule to simplify and add control to a game that was largely complete before the rule was added. You at least had the game in a state where it was ready for testing. On paper, though, it doesn’t sound simple or empowering. I wonder (and, again, it’s next to impossible to speak critically about a game I know so little about, so I could be way off) if you’ve possibly fallen into the trap of seeing what you set out to make, rather than what you’re actually making. From my (incredibly ignorant!) perspective, it sounds like you’re trying to make a game about FINDING words, when the mechanics you’ve described sound much better suited to TRANSFORMING words. How many simple goals and rules can you ask a player to juggle in his or her mind at once? This game is kind of a Bookworm Adventures thing, only good, right? Hahaha – yeah! That should be the tagline for the game. i’ll admit, Spellirium looks simple on the surface, but it’s trying to do a LOT. i feel like i’m risking a systems collision with everything i try to “fix”. The mechanic is that you click any two letters in the grid and they swap places. Then you click and drag to build a word orthogonally (but never diagonally). The tiles can be one of 25 letters (Q and U are combined), and one of five different colours (“white” disappears from the game once you’ve unlocked red, blue, green and yellow). There’s no time limit. You lose energy every time you swap tiles. The farther apart the tiles are, the more energy you lose. You get a base Scrabble-style score from the word you build, and colour bonuses on top of that. So there are many things the game can “read” from the player’s interaction: word quality (what the word is), word colour, word length, word direction, number of swaps, and patterns (ie chaining based on the previous word). The puzzles in Spellirium are structured from those data. So sometimes to solve a puzzle, you need to make words in a certain direction. Or words of a certain colour. Or sometimes you need to make specific words (which is where you might need a certain letter). All this variety and complexity is inspired by Puzzle Quest which, while a great game, i felt suffered from a lot of monotony. There wasn’t enough variety or interest in monster battles for me … i wanted the game to keep me on my toes a little more. Anyway, Shan’s neighbour rule was quick and easy to implement, so it’s in the game for now. We just haven’t thoroughly tested it yet. i did notice that there’s something wrong with the random vowel thing, because i watched a lot of Y’s creep up on one player. But you can imagine in a game like Spellirium the difficulty i face in trying to parcel out the game’s complexity in digestible chunks. Okay, so I was right in thinking that I’m totally unqualified to offer any real criticism – it sounds like something I’d have to play to understand. Aha! Have i lost you? The challenge before me is to drive interest in the game, as nuanced as it is. Maybe a gameplay video would help, with me yapping over it and explaining what’s what? I’m absolutely still interested. It just seems like a game that would make much more sense to play than to understand. Which I generally prefer! I mean, think about explaining Super Mario Bros. in words. You could tell me that there’s a guy who walks and runs and jumps and sometimes he gets big and then he can break brick blocks that float in the air because he touches a mushroom that comes out of a question mark block and also the mushroom sometimes comes out of the other kinds of blocks or even invisible blocks and also flowers let you shoot fireballs and have I told you about the deadly turtle guys? But you play the thing, and it’s incredible intuitive. Even in a description that leaves out all the many details of what Mario is, it’s tough to explain in words the feel of Mario’s momentum and variable jump height, and all the other subtle touches that separate Mario from lesser platformers. So, yeah, seeing it would probably make more sense than imagining it. But! Even if I took a look at it, you’d probably get your best feedback from people who have actually played it, rather from idiots like me who pretend they know what they’re talking about. Wow. Just glanced back at my comment. Writing errors galore. Eek. 2. Put the letters in a stack to make sure that each letter gets it fair chance to be dropped in the grid. We’re already doing #1 (borrowing Scrabble’s distribution), but it’s no help when you feel you absolutely NEED a “C”. I understood it! I like it! I think it makes lots of sense when you are desperate for the “L”! GO GO GO! I want to play! Doing my very very best! An important announcement awaits you in a couple of weeks. Be excited! From what you’ve said, it sounds like the most important time for the player to be able to influence the new tiles is when they are looking for specific words (like the shear-the-sheep screen shot you’ve shown before). But in other game modes, maybe you want your letter distribution to be closer to english-language distribution. Because in neighbo(u)ring letters mode, isn’t your grid likely to get skewed with an excess of letters like V, P, J, G, Qu, F and K (from T, N, H, R, D, L), especially on levels where you spend a long time making words? I like the idea of the powerup (but not the forms in triplicate). But maybe there’s a letter lemur carrying these powerups around, St. Bernard style, and it likes to hang around the spell specific word levels. Or there are occasional powerups (or stars, spell components, scrolls, whatever) that drop into the grid, that need to be swapped together to let you choose a letter at that spot. Then you can adjust difficulty by changing the frequency of the stars, and how close they land together in the grid. There’s a 50% chance of getting those more challenging letters you mentioned (V, P, J, G, Qu, F and K) from T, N, H, R, D and L. The other 50% of the time, you would get S, M, G, and C instead. i’m not sure it’s a problem yet … but it bears further playtesting. Remember, it’s not like Scrabble where you’re stuck with 7 letters and most of them are glottalic consonants :) You may draw down challenging letters, but that’s in a 49 tiles. If you spend your tricky letters instead of ignoring them, you flip it back around to friendlies. The powerup system as it’s currently implemented is rather broken … it just takes way too much effort to “cast a spell” (craft a powerup). 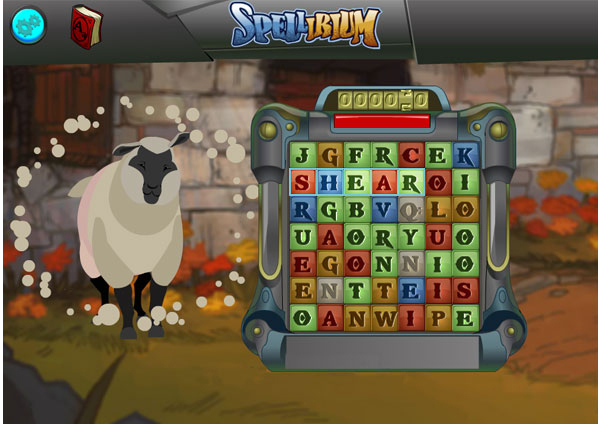 You have to get the spell by completing a ‘cheeve (for example: Build 25 blue words). Then you have to collect the ingredients, either by defeating a specific monster or by purchasing them in the store (each ingredient costs a specific set of words). Then you have to hit the “cast” button and complete a challenge. It’s just … it’s pretty insane right now. The next major playtesting build will try to fix that by making it much more reasonable. Oooh! I think that’s really handy. Your explanation makes perfect sense to me. Your illustration to go along with it seems backwards (since L was the target letter you wanted, I would have highlighted K, and have L and J be semi-outlined). I’ve just used this feature successfully myself. I find it works rather well so far.